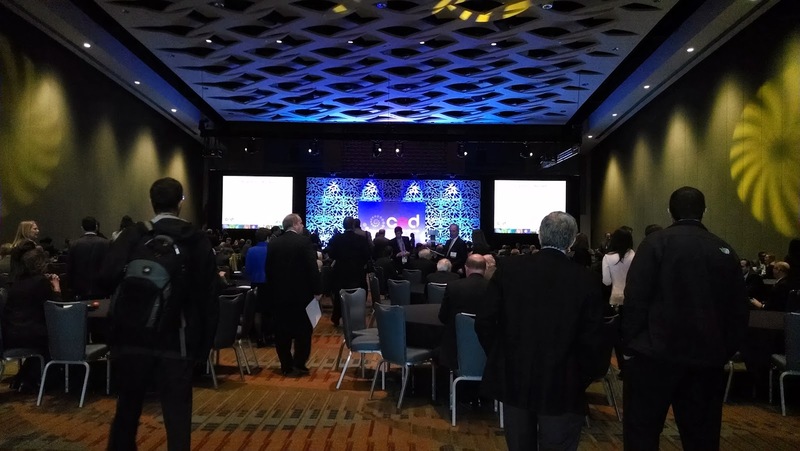 The CED Life Sciences Conference is the largest biotech event in the Research Triangle Park (RTP) and spans 2 days with over 1,000 attendees. You can check out the agenda for the 2014 conference here. Students have an opportunity to volunteer for one shift during the 2 days and in return get a discounted ticket price ($100) and access to the conference. A couple of MBA students from Fuqua and UNC Kenan-Flagler volunteered and it was a great time. Because the main talks started in the afternoon, I was able to go to all the talks and networking events for the first day. I did have to miss the startup showcase in the morning, though. In the morning, I helped out with greeting attendees, handing out their name tags and conference materials, and making sure they were able to find their way around the convention center. It was great as I was able to reconnect with many local biotech professionals who I met through various projects during the Duke MBA. The main ballroom right before the keynote address by FDA Commissioner Margaret Hamburg, MD. For more photos from the CED Life Sciences Conference, go here. The talks were fantastic, as expected. I particularly enjoyed Michael Astrue and Jeremy Levin's talks - on public private partnerships and the future of the pharma innovation and how it will be impacted by high tech, respectively. The panel on accelerated approval by the FDA was also very useful and relevant for my startup project in Fuqua's Program 4 Entrepreneurs. As I mentioned in previous blog posts, going to these events offered a closer view of what it is like to operate on the cutting edge of the life sciences industry. It helped round out the lectures and discussions from the MBA classroom. This is particularly important for the biotech industry, as regulations are constantly being updated or created to keep up with the pace of innovation. During the breaks, I was able to learn more about the services that support the biotech industry. For example, I did not know that Wells Fargo offered treasury services for pre-revenue biotech firms. I also met lawyers from intellectual property firms that work exclusively with life sciences firms. Finally, it was great to get connected with more of the awesome staff at local commercial development organizations - the NC Biotech Center and CED. I learned about the NC Biotech Center's $100k Collaborative Funding Grant - perfect for statups that want to do proof-of-concept work in collaboration with an academic lab in North Carolina. For a full list of NC Biotech Center grants, go to this page. Overall, I felt very empowered by attending the CED Life Sciences Conference. Biotech entrepreneurs face significant challenges (scientific, regulatory, funding, intellectual property, etc) and it is great to be surrounded by the startup culture in the RTP. I could tell that this supportive environment is very conducive for entrepreneurial activity and would really make a difference for new entrepreneurs making the first leap. It is not a surprise why biotech has thrived as it has in the region. The day ended too soon. After connecting with a few folks during the evening reception I had to get back and study for my core Operations course. Its final exam was the next morning so I was unable to attend day 2 of the conference. It was too bad, as I was really looking forward to hearing Clayton Christensen speak in person. This is the second CED event I've attended so far. Read about my experience at one of CED's Biotech Forums.